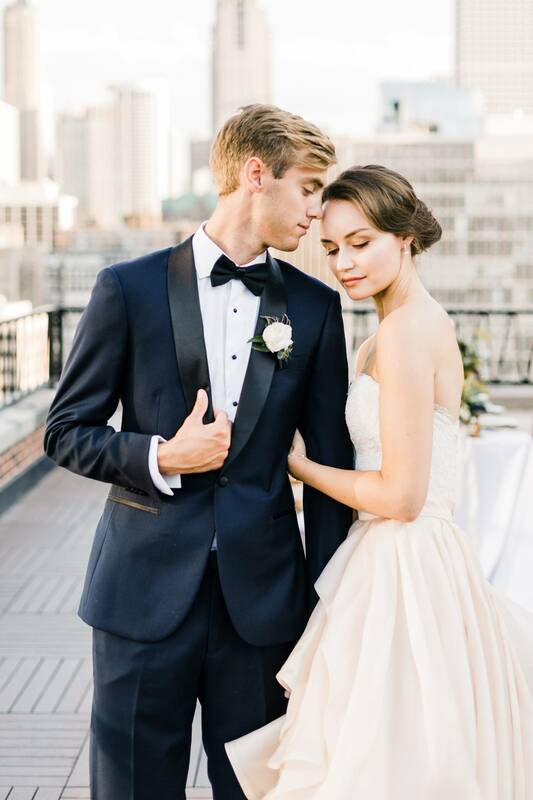 DABBLE ME THIS and JENNA MARIE PHOTOGRAPHY pooled their resources together and worked with some of Chicago's top wedding vendors to create an inspirational wedding shoot that was was not only romantic but would showcase the Chicago's stunning skyline. 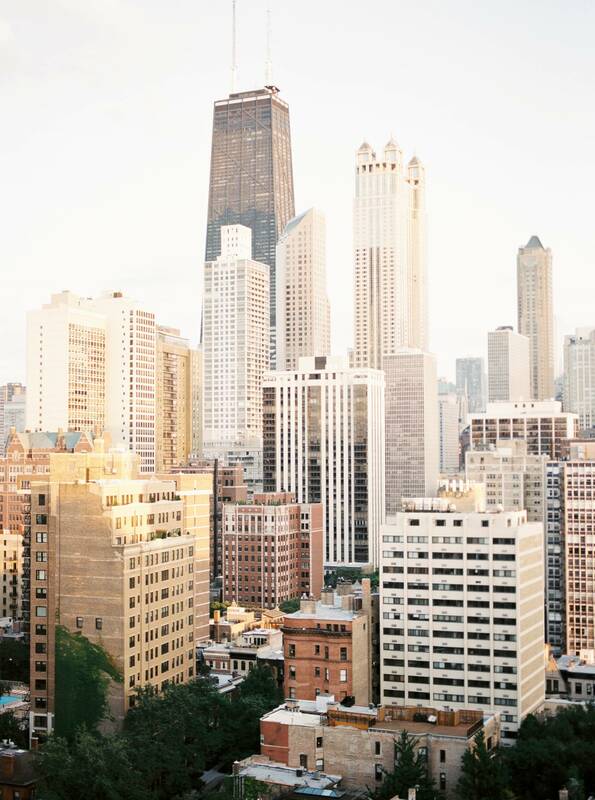 Set during the golden hour in the heart of downtown Chicago the AMBASSADOR CHICAGO was chosen for its Quintessential rooftop skyline. It provided the team with the perfect spot for an intimate wedding with a breathtaking view over this city of theirs. 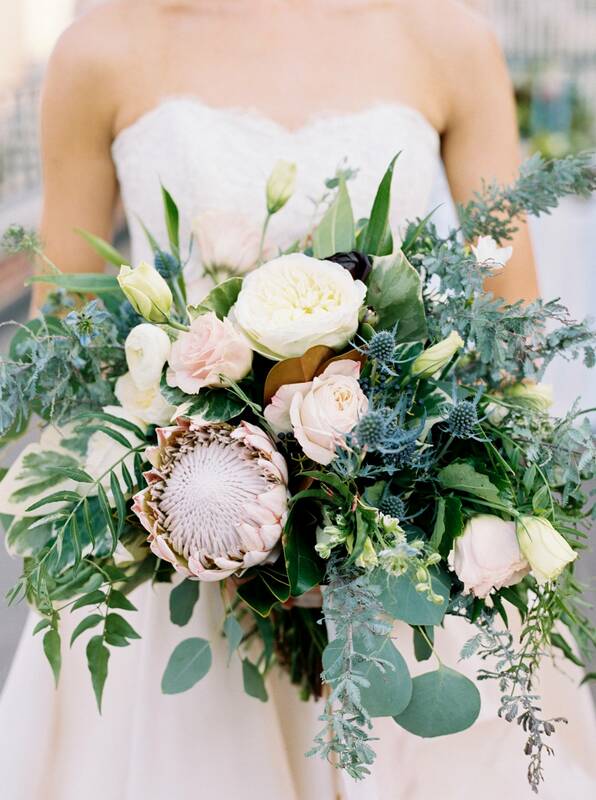 Soft dusty blue, blush and tan with a hint of gold were used as the main colour palette. Stationery by KELSEY MALIE CALLIGRAPHY set the tone for the cake design by ELYSIA ROOT CAKES and florals by EXQUISITE DESIGNS - whose stunning creations incorporated garden roses, thistles and a king protea. Giving it an overall timeless and romantic appeal. "The icing on the cake for the inspirational wedding was working with one of our favourite dress designers CAROL HANNAH to provide a soft whimsical wedding dress that tied all the details of the wedding back together." Chicago wedding make-up artists NIKA VAUGHAN BRIDAL ARTISTS created a beautifully soft and romantic bridal look that is as timeless as it is modern. Chicago make-up artist NIKA VAUGHAN is a valued member of our vendor guide. Specialising in beauty, airbrush, and bridal makeup for weddings, photography, and video they have teams based in both Chicago and California. Their signature style is a fresh faced, red carpet look, and with a deep appreciation for freckles and a natural glow, they feel that every bride should feel like the most beautiful version of herself on her wedding day. See more of their work in our vendor guide and be sure to check out this Dramatic wild Icelandic Bridal Shoot they worked on. Will this be in a magazine or is it just online on the website.